The concert on 12th May was Michael's last one as our conductor, leaving us to become Musical Director of the Choral Society of Durham from September 2012. We were very sorry to lose Michael but warmly congratulate him on this appointment. Michael is a successful choral conductor and music educator. He is Head of Music Technology at St. Thomas More Catholic School, Blaydon and Musical Director of the Prudhoe and Gleemen Choral Societies. He has worked with numerous other choirs including National Youth Choirs of Great Britain, Huddersfield University Choir and Felling Male Voice Choir. Michael delivers lectures at Durham University on Choral Conducting and is currently Music Technology coordinator for the Durham PGCE course. Michael is passionate about increasing numbers involved in Choral music and at present is setting up Gateshead Youth Choir and a Youth Male Voice Choir for the North East. Michael took over as the Conductor of Guisborough Choral Society on 1st January 2009. 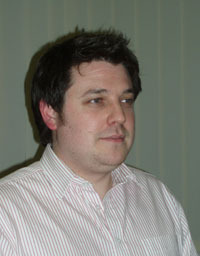 Michael Summers MA BMus(Hons) P.G.C.E.